Medium Hydrangea Petalear™ Creates Beautiful Flowers in One-Fifth the Time! The Medium Hydrangea Petalear™ is the dream cake decorating tool you’ve been waiting for! Now you can make beautiful, life-like hydrangea flowers from gum paste or fondant in one-fifth the time it would normally take. This flexible mold from the James Rosselle collection quickly cuts and veins five flowers simultaneously. 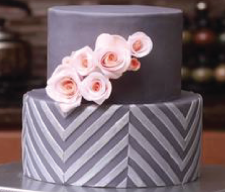 Apply individual flowers directly to the cake, wire them and make clusters or apply them to a ball of fondant or a fondant covered half-sphere of Styrofoam. Imagine the gorgeous spring, Mother’s Day and wedding cakes you can make without spending days in advance creating flowers. No other hydrangea silicone mold, cutter or veiner can match the results of Marvelous Molds® innovative Petalear™.